Last week my lovely friend Emily (of Ruby Slipper Journeys) asked for my help in finding a similar sweater to this Chloe Sevigny for Opening Ceremony Cropped Crew Neck Pullover. She didn't have a specific price but asked that it be, "a grey, pullover cropped sweater (it has to be cropped as a lot of my dresses are high waisted). It doesn't have to be cheaper, well, not cheaper than the sale price, but if it's on the expensive side I want it to be made out of some reasonable material... like wool!" So...here we go! There was also this cropped McQ sweater but it has lighter grey on the sleeves which isn't what Emily wanted, you may see it here though! I like the bridgette bailey the best! I love your blog! You have great style and I love your features, especially Dress for Less and Inspiration! I love the birdget bailey the best (haha, of course i go for the most expensive) but the color is perfect, and i like the scoopier neckline. love your post!! I buy on line but some of these webs are new for me!!! thanks for sharing it!!! I love that H&M one - you found quite a few good candidates. Also you did a great job. Great finds love! I am obsessed with cropped tops at the moment! like the one by H&M. Grat post! I like the h&m one! Their a very good basic to invest on! thanks! i love those pleated pants. :) i wear em any chance i get. we have a ton of colors at american apparel. we also have a cropped pullover, but these ones are super cute too! Wow your search was quite thorough. I really love the inspiration and will try the sweater over the dress thing. I like the h&m one even though I'm sure the quality isn't as great as some of the others. Aw, thanks! I like the Splendid one (grrrr) and also the H&M one. Might try and see if they have that somewhere I can try it on! It's completely true about good basics being hard to find... one of the reasons I hate shopping for basics! 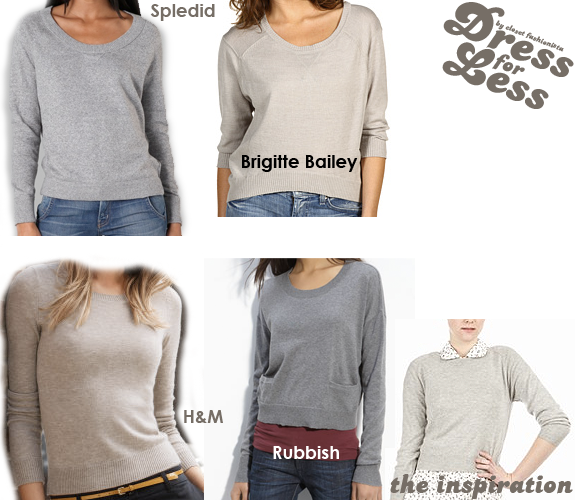 i really do like the bridgette bailey one, its looks perfectly slouchy. I love grey jumpers! Not sure why... Think I might have the H&M one, actually. The H&M one is for sure my favorite!! Great finds. Love them all. And just good deals, too! Thanks! I love the H&M one!